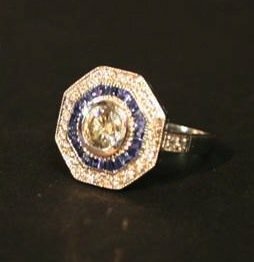 An 18ct. 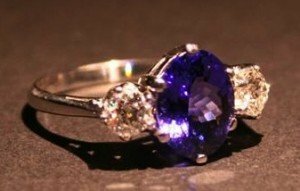 White Gold Tanzanite and Diamond Three Stone Ring with a central oval tanzanite flanked by diamonds within a pierced setting, approximately 0.52/3.0ct. 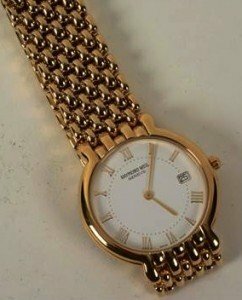 A Raymond Weil lady’s wristwatch, the circular white enamel dial with date aperture and Roman numerals, on flexible gold plated bracelet strap. A Pair of 18ct. 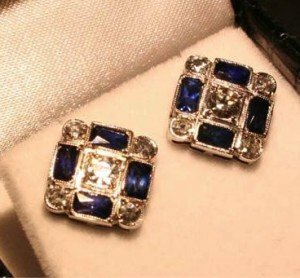 White Gold Art Deco Style Sapphire and Diamond Ear Studs of square form, each set with four sapphires and five diamonds, approximately 0.70/1.20ct. An 18ct. 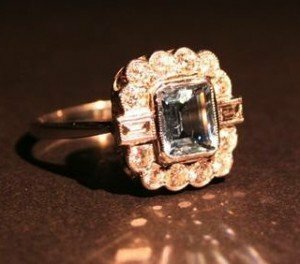 White Gold Aquamarine and Diamond Ring, with a central rectangular aquamarine surrounded by diamonds and with baguette shoulders within a pierced setting, approximately 0.75/1.10ct. Five yellow metal tie pins, three in the form of horseshoes – one seed pearl and one turquoise, and one with moonstone and one with aquamarine, 6.1g, together with a 9ct gold banded watch chain in the form of a rope, a 9ct gold watch and a yellow metal watch. 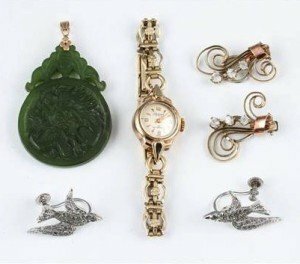 A carved green oriental hard stone pendant with yellow metal fitting, stamped 14k, a 9 carat yellow gold cased Accurist wrist watch, the cream tone dial having quarterly Arabic numeral markers and hourly baton markers, on a rolled gold bracelet strap, a pair of yellow metal clip earrings of scroll design and each set with three graduated colourless pastes, together with a pair of marcasite set bird design earrings. A 14ct. White Gold Sapphire and Diamond Cluster Ring, with a central diamond surrounded by a tier of sapphires and a tier of diamonds and with diamond shoulders, approximately 0.45/1.05ct. A yellow metal amethyst and seed pearl pendant brooch, the flower motif set with central round cut amethyst flanked by seed pearl petals and a further six oval cut amethysts to surround, 4.4g, 2.5cm diameter, together with a 9ct gold ruby and seed pearl moon and star brooch, 2.4g. 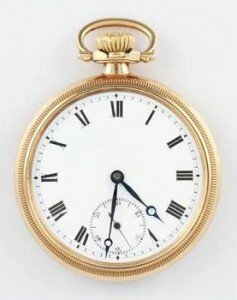 A yellow metal crown wind pocket watch, the white enamel face having black Roman numeral hourly markers with minute track border and subsidiary dial to six o’clock, case rear having machined design with black cartouche centre. A Sino-Tibetan gilt bronze kila, the head possibly of earlier date, with moulded faces to three sides, applied with blue enamel jewel ling. 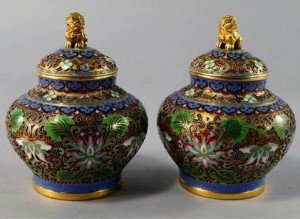 A pair of Chinese gilt bronze and cloisonné jars and covers, 20th century, decorated throughout with lotus blooms, the covers with lion dog finials. 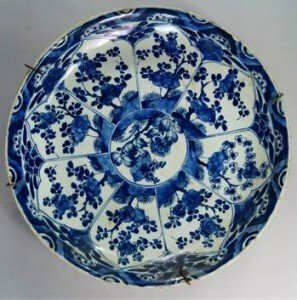 A Chinese kraak porcelain bowl, Kangxi period, painted in underglaze blue with panels of blossoming prunus, underglaze blue lingzhi mark to base within a double ring. 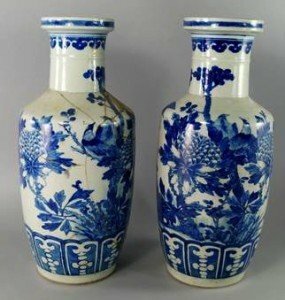 A pair of Chinese porcelain rouleau vases, 19th century, painted in underglaze blue with birds amongst blossoming chrysanthemum sprays. 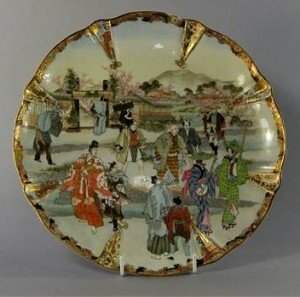 A Japanese kutani charger, early 20th century, of lobed form and painted with various figures and musicians in a river landscape scene, inside a gilt heightened floral decorated border, iron red six character mark to base. An Edwardian silver novelty pin cushion in the form of an elephant, Birmingham 1906 by Cornelius Desormeaux Saunders & James Francis Hollings Shepherd, height approx 4.5cm, together with a similar smaller pin cushion. 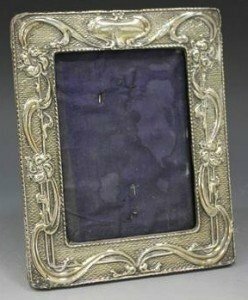 An Edwardian silver rectangular photograph frame, decorated in relief with scrolling tendrils, leaves and flowers against a textured ground. 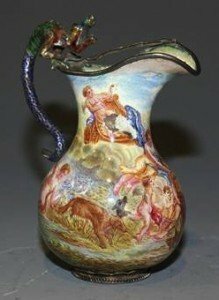 A late 19th Century Viennese silver and enamel cream jug, of baluster form painted with a classical scene flanked by a dragon handle. A Victorian silver sugar caster, the pierced dome cover with spiral finial above a baluster body with spiral and reeded decoration, on a circular foot. 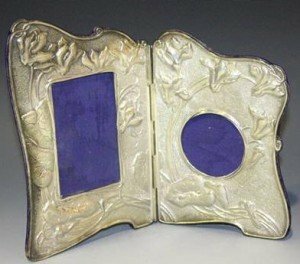 An Art Nouveau silver mounted hinged double photograph frame, embossed with cyclamen and leaves, framing a rectangular and circular aperture, engraved inscription, Birmingham 1907 by E. Mander & Son, height approx 21.2cm. 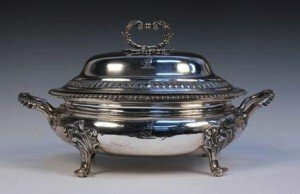 A late Victorian silver oval soup tureen and cover, the domed cover with foliate scroll handle and gadrooned border, the compressed body with gadrooned rim, flanked by a pair of foliate and shell moulded handles, on four scroll shouldered scroll feet, each piece engraved with a crest of an antelope’s head with collar and chain.